Are Above Ground Pools Hard to Install? Posted on April 15, 2019 April 10, 2019 , in Above Ground Pools. Once you’ve made the decision to purchase a pool, you may find yourself asking, “Are above ground pools hard to install?” The fact is, with the proper tools, some handyman skills and some motivation, it can be possible to install the pool yourself. In this article, we’ll go over the main steps to give you an idea of the work involved. You’ll need to remove any grass where the pool will lie or it’ll eventually grow through your liner. Remove the sod all the way down to the dirt and make sure to leave a border around the edges of the pool as well. Using a carpenter’s level placed on a large sheet of plywood, ensure the ground is level. If not, remove dirt until you’re within an inch being perfectly level. 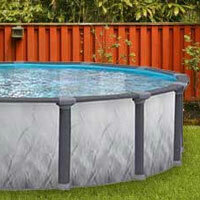 Dig down, do not build up, because the weight of the pool will eventually cause any built-up areas to flatten. A layer of sand topped by what’s known as Gorilla pads creates a soft, but stable surface on which to assemble your pool. The sand will protect the pool liner from puncture by rocks or growing plants as well as provide a soft underfoot feel. Gorilla pads are made of a strong felt that gives the liner an extra layer of protection. You’ll need to sink patio blocks into the ground to act as a support for the pool frame’s posts. The patio blocks have to be flush with the ground and level with each to within one-sixteenth of an inch. Failure to keep these blocks level with each other may result in the pool walls buckling. Taking the time to get this step correct will save you a lot of headache in the future. When laying down the bottom track, you’ll need to measure, remeasure and measure again to ensure everything is level and in proper alignment. Make sure your posts are standing up straight and square. Unroll the wall into the bottom track and apply for the top plates as you go along to give the wall stability. Connect the wall components with the nuts and bolts provided. The cove is a six to eight-inch high layer of sand angled at 45 degrees that runs along the inside of the pool wall. It protects the pool liner from the metal edges of the pool wall. This is another important part of the construction that should be done carefully. Installing the liner should be done on a warm and sunny day to allow it to become flexible. Let it sit in the sun for a few hours to allow it to warm up. Do not wear shoes, only socks or bare feet, when installing the liner. Also, be careful about trapping any rocks under the liner. Try and get any large wrinkles smoothed out. There will always be some wrinkles, but large folds need to be taken care of. Complete the frame following the instructions provided by the manufacturer. Ensure everything remains straight and level. Tighten any bolts loosely at first to allow for adjustments to be made. Recheck to make sure all the top plates are level and the bottom rails are secure in the bottom plates. Once everything is in proper position, tighten all the bolts. To learn more about above ground pools, download a free brochure.